Immunohistochemistry (IHC) combines histological, immunological and biochemical techniques for the identification of specific tissue components by means of a specific antigen/antibody reaction tagged with a visible label. IHC makes it possible to visualize the distribution and localization of specific cellular components within a cell or tissue. The technique is widely used in dermatologic diagnostics and research, and its applications continue to be extended because of its ease of use, reliability, and versatility. 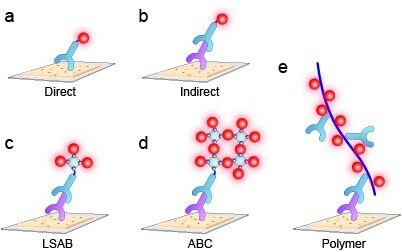 In IHC, an antigen–antibody construct is visualized through light microscopy by means of a color signal. The advantage of IHC over immunofluorescence techniques is the visible morphology of the tissue around the specific antigen by counterstaining, e.g., with hematoxylin (blue). Results of stained IHC markers are reported semiquantitatively and have important diagnostic and prognostic implications, particularly for skin tumors, lymphoma, and the detection of infectious microorganisms. Figure 1 shows a typical immunohistochemistry workflow. Step I~V are sample preparation procedures, step VI~IX are analytical procedures. Figure 1. Workflow of Immunohistochemistry. I. tissue collection; II. Fixation; III. Embedding; IV. Sectioning V. mounting; VI. Antigen retrieval and blocking; VII. Primary antibody reaction; VIII. Labeled antibody reaction. IX. Staining and counterstaining. One of the main purposes of immunohistochemistry is to visualize the morphology and architecture of the tissue sample and its relationship with the target antigen. The sample preparation steps are very important for a successful immunohistochemistry by maintaining the nature structure of tissue and activity of the target antigen. Depending on the aim of experiment, tissue samples can be obtained in different ways such as punch/core biopsy, excisional/incisional biopsy, etc. Tissue degradation begins at the time of sample removal. Following tissue processing should be done very soon. The sample preparation stage begins as soon as a piece of tissue is removed from its nutritional source (blood supply) and the time to fixation is critical. Degeneration is caused primarily by autolysis, which is a process of self-digestion by enzymes contained within cells; and this begins immediately. This process is accelerated by increased temperatures. Fixatives are used to stop degeneration, while preserving the structure and integrity of the tissue elements as much as possible. However, fixation itself introduces artifacts and the ideal fixative would also maintain the structure of all of the epitopes in the tissues. This is not achievable, as the alteration in chemical structure caused by fixation necessarily modifies at least some epitopes. The sample should be fixed as soon as possible after surgery, ideally within less than an hour. The chemical fixation crosslink proteins in the sample are thereby stopping the degradation process. Too short or too long fixation can affect the staining result. Part of the challenge when choosing a fixative is the fact that the amounts of antigens or molecular targets within tissue specimens are finite. Although fixatives are meant to preserve these elements from elution, migration or degradation by changing the protein structure, they may destroy or mask these targets. There are many fixative recipes, but most of these can be grouped into three main categories: those containing formalin; those containing alcohol; and those containing a combination of both. Regardless of the fixative of choice, the preparation and use of that solution must be consistent. Of the many pre-analytical variables which affect IHC and ISH results, fixation is probably the most significant, impacting many other variables such as antigen retrieval and epitope binding. Unfortunately, to date, no single fixative has proven to be ideal for all targets and detection methods. However, it is generally more deleterious for tissue to be ‘under fixed’, rather than ‘over fixed’. 10% Neutral Buffered Formalin (NBF): The most frequently used fixative is 10% NBF with pH 7.0 to 7.4. Formalin fixes by penetrating the tissue and forming cross linkages between reactive amino groups in proteins. Tissue measuring 4mm thick should be fixed for at least 24 hours at room temperature. Alcohol Fixation: Alcohol fixation has an advantage over formalin fixation, in that it generally eliminates the need for antigen retrieval. It initially penetrates and fixes tissues more readily than formalin (although penetration slows down subsequently), and is often recommended for nucleic acid work. After fixation, the sample is embedded in paraffin for long-term storage and to enable sectioning for subsequent staining. Once embedded in paraffin, samples can be stored (almost) indefinitely. During embedding process, fixation reagents containing water are replaced by wax which is done through a series of passages through increasing concentrations of alcohol, up to 100% (absolute) alcohol. This process is followed by clearing the alcohol from the tissue (for example by using xylene) and replacing it with molten wax. Low melting temperature (45 °C) as opposed to higher melting temperature (65 °C) waxes have been reported to produce better staining results for IHC, particularly in T-lymphocyte staining. Next, the paraffin infiltrated pieces of tissue are embedded to form blocks, which are easily handled, cut and subsequently stored. Formalin-fixed, paraffin-embedded tissues are sectioned into thin slices (4-5μm) with a microtome. Generally, unless otherwise specified by a protocol of choice, sections for IHC or ISH are cut at 3μm, 4μm or 5μm. Thicker sections may cause difficulty during staining, and also problems in interpretation due to the multi-layering of cells. The sections are then mounted onto adhesive-coated glass slides. After sections are cut they are usually floated on the water and picked up onto glass slides that are coated with some adherent material. Sections must lay flat against the glass to prevent lifting during staining or bubble formation, which may trap staining reagents. Due to the fixation process, antigenicity of the antigens on the tissue were affected. An antigen retrieval treatment is applied to unmask the epitopes, either by heat (heat-induced epitope retrieval; HIER) or enzymatic degradation (proteolytic-induced epitope retrieval; PIER). Incorrect antigen retrieval for the biomarker of interest will adversely affect the staining result. Firstly, wax must be removed completely from the tissue sections, so that aqueous antibodies, molecular probes and detection reagents can penetrate and adhere to the tissue. Traditionally, dewaxing was done by immersing the sections into a dewaxing solution (such as xylene), with or without prior brief heating. HIER is the most common approach to antigen retrieval, and temperature, pH and time of incubation are critical factors that must be optimized for proper antigen unmasking without causing morphological damage. Sodium citrate (pH 6) and Tris/EDTA (pH 9) buffers are commonly used with HIER in conjunction with the heat source (microwave oven, pressure cooker or vegetable steamer). PIER approach utilizes the enzymatic activity of pronase, pepsin, ficin, trypsin or proteinase K to partially digest proteins to unmask the antibody epitopes, and the efficacy of using PIER is dependent upon enzyme concentration and incubation time. Antigen retrieval can be performed using either HIER or PIER, or through a combination of both approaches. An antibody with specificity for the biomarker of interest is applied. The specificity and sensitivity of the antibody affect the staining result. For primary antibodies the sensitivity and specificity are the core elements. Ideally, the primary antibody must provide both a high sensitivity and a high specificity to produce an accurate and robust IHC assay. The antigen/antibody complex signal is amplified and visualized using a detection system. The strength of amplification of the reaction affects the staining result (intensity). Similar to ELISA, there are basically two types of detection method of IHC: direct and indirect method. By the introduction of the biotin-avidin system and polymer backbone, indirect method has three different variants: the Labeled Streptavidin-Biotin (LSAB) Method, the Avidin-Biotin Complex (ABC) method and polymer method (Figure 2). Streptavidin (from the bacteria Streptomyces avidin) and avidin (from chicken egg) both have four binding sites for biotin. The biotin molecule is easily conjugated to antibodies and enzymes. In the avidin-biotin complex (ABC) method, secondary antibodies are conjugated to biotin and function as links between tissue-bound primary antibodies and an avidin-biotin-peroxidase complex. The four binding sites for biotin make ‘lattice’ complexes possible, where the avidins are linked together via the enzyme. In a similar method, the labeled streptavidin-biotin (LSAB) method also utilizes a biotinylated secondary antibody that links primary antibodies to a streptavidin-peroxidase conjugate. This approach has the advantage that preassembly of the ABC complex is not needed. In both methods a single primary antibody is subsequently associated with multiple peroxidase molecules, and because of the large enzyme-to-antibody ratio, a considerable increase in sensitivity is achieved compared to direct peroxidase-conjugate methods. The limitations associated with the avidin-biotin system, led to the development of detection systems with higher sensitivity and specificity, employing polymer-based IHC techniques. These methods utilize a polymer backbone to which multiple antibodies and enzyme molecules are conjugated. As many as 70 enzyme molecules and about 10 primary antibodies can be conjugated to a single dextran backbone. This construct allowed the entire IHC staining procedure, from primary antibody to enzyme, to be accomplished in a single step. Figure 2. 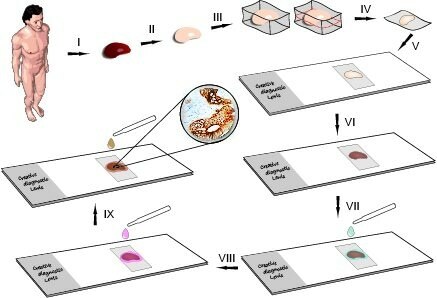 Different detection methods for Immunohistochemistry. (a) Direct method; (b) Indirect method; (c) Labeled Streptavidin-Biotin (LSAB) Method; (d) Avidin-Biotin Complex (ABC) method. (e) Two-step polymer method. Here is the comparison of different methods described above (Table 1). Table 1. Uses and limitations of different detection methods. for double staining; when secondary antibody produces high background. Requires significant quantities of primary antibody to directly label with the enzyme. Gives weak staining because of minimal amplification. When the direct protocol does not produce sufficient signal and further amplification is required. May demonstrate increased background due to secondary antibody. For increased signal amplification. May produce increased background due to endogenous biotin. In the presence of the appropriate substrate, the enzyme causes precipitation of a colored reaction product at the site of the antigen, which is known as staining process. It is the last and the most important step that make the antibody labeled antigen and tissue visible to us. There are several features of immunohistochemistry that make it possible to use this methodology to detect two antigens simultaneously. This method is often referred to as the double-staining method. Because this procedure uses the light microscope to visualize the reaction product, it is possible to identify reaction products in the context of tissue morphology and topography based on their different colors. The staining results are relatively permanent. It is often possible to localize the antigens on a cellular or subcellular level. There are a number of possible combinations of enzymes and substrates (Table 2). Table 2. Commonly Used Immunocytochemistry Enzymes and Substrates. Counterstains give contrast to the primary stain and can be cell structure-specific. These single-step stains are usually added after antibody staining. Hematoxylin is commonly used as a counterstain for IHC due to a number of advantages it offers in the interpretation phase of the IHC stain. The blue nuclear coloring by hematoxylin produces a high level of contrast for the human eye, between the brown DAB chromogen, and red AEC chromogen. This facilitates improved visualization of tissue on the slide, assessment of tissue morphology, and determination of stained structures and cells. The counterstaining step of the protocol must also be optimized to reduce variability in intensity, which may otherwise lead to difficulty in recognizing nuclear localization of the chromogen. Too intense counterstaining can lead to an optical distortion, especially for nuclear antigens, and too weak counterstaining may impair the tissue morphology assessment. After all staining is completed, the sample should be preserved for long-term usage and storage and to prevent enzymatic product solubilization or fluorophore photobleaching. Sealing the sample by mounting a coverslip with an appropriate mountant stabilizes the tissue sample and stain. If you want to know more about frequently asked technical questions of IHC, sees IHC trouble shootings. 1. Hofman, F. M. and Taylor, C. R. 2013. Immunohistochemistry. Current Protocols in Immunology. 103:21.4:21.4.1–21.4.26. 3. Munson P. Immunohistochemistry[M]//Basic Science Techniques in Clinical Practice. Springer London, 2007: 18-30. 4. Key M. Immunohistochemistry Staining Methods[J]. Education Guide Immunohistochemical Staining Methods Fourth Edition, 2006: 47.